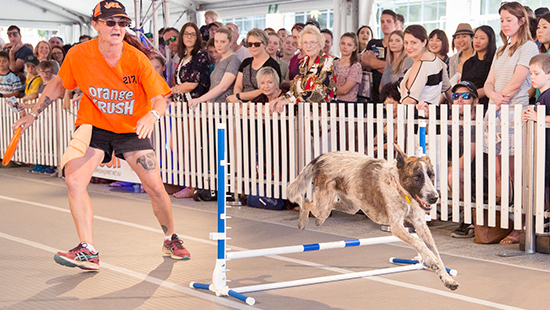 Visitors cheered on their favourite K9 Athletes from Australia, England, Canada and New Zealand in the inaugural 2018 Common Woof Games! 2018 was a big year for sporting fans around the world, and the Dog Lovers Show didn’t believe sport needed to be limited to just two-legged athletes! Taking the opportunity to showcase Dog sports like never before, the ‘Common Woof Games’ tested the most elite K9 athletes across both days of the event. The Dog Lovers Show 2018 was proud to present a comprehensive competition program comprising of 11 popular fusion sports categorised into Ball-Sports, Track & Field, and Aquatic sectors as part of our Common Woof Feature. The ROYAL CANIN® Arena hosted a wide array of Common Woof Games events with a jam-packed program including the opening ceremony extravaganza, half-time entertainment by The Wonderdogs, a swag of competitions, and of course, some emotional medal presentations crowning the woofing-winners. With everything from Hurdles to Barrel Racing, Basketball to Socca and even Discus Throw – some of Australia’s most talented K9s trained very hard to wow you with their agility, skill, and sporting prowess! Brisbane also played host to the aquatic section of the Common Woof Games where the Black Hawk DockDogs Pool presented a program of breathtaking water sports including the Big Air® and Speed Retrieve competitions. The program featured Big Air ®(Long Jump), Speed Retrieve®, and Extreme Vertical® (high jump for dogs).